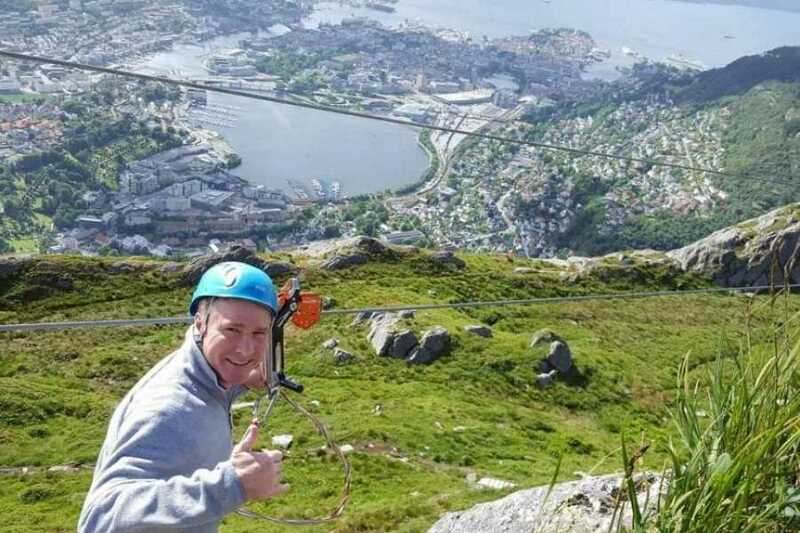 Experience Zipline on the highest city mountain in Bergen. This adventure takes place on Mt Ulriken. The Zipline offers scenic views and a adrenaline rush. It is not physically demanding, but rather mentally challenging and you get a great sense of achievement when you reach the end. The Zipline starts under the terrace in front of the restaurant on Mt Ulriken and glides 300 metres in the direction of Mt Fløyen. There are instructors at both ends to ensure you have a safe ‘flight’. The Zipline is 300 metres long. Meet at the designated time beside the Zipline, which is located in front of the restaurant on top of mount Ulriken. Please ensure you arrive on top of Mt Ulriken before the time you have booked. Note that approx. 15 people can be booked to do the zipline per hour, so there may be some waiting. If you arrive late, we will try to get you on the Zipline as quickly as possible. Also note that there may be queues for the Ulriken cable car. We would advise you to take a bus from the centre of Bergen 1-2 hours before the time you have booked to ensure that you arrive on time. This will also give you time to enjoy the views from the top of the mountain. Ulriken is the highest city mountain of the seven mountains surrounding Bergen. You can take the Ulriken cable car to the top. The bus leaves from just across the road from the Tourist Information, and it takes about 15 minutes. You can buy tickets for the bus and the Ulriken cable car at the bus stop from 8.45 or at the Tourist Information in Bergen. Departs from the city centre on the hour from 9.00 – 18.00. Departs from Ulriken at a quarter past the hour from 9.15 - 17.15. The last bus leaves at 18.30. You can also use the regular bus service. Bus no. 2, 3 or 80 from the city centre (‘Småstrandgaten’ outside Exhibition shopping centre), direction south. Get off at ‘Haukeland sjukehus N’ just before the tunnel. Cross the road on the footbridge and follow the signs up the road ‘Haukelandsbakken’ to the Ulriken cable car. It is a 5-10 minute walk from the bus stop. Buses leave every 10 minutes, and take about 10 minutes to get to the stop for Ulriken. It is also possible to walk to the top. The hike starts just behind the cable car building and takes about 1 hour. This is a popular walk for tourists and locals alike. First day of the season will be puslished soon. Book a slot for the Zipline. The Zipline must be booked at least 1 hour before the start time. Please ensure you arrive on the top of Mt. Ulriken before the time you have booked. Zipline with instructor and all the necessary equipment. The Ulriken cable car and bus are not included. For groups of more than 10 persons, or those who want to do the Zipline outside our opening hours, please contact us for further information.